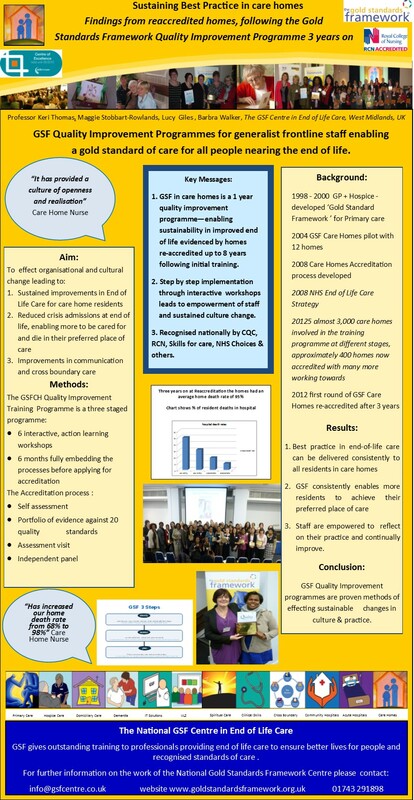 To qualify for accreditation, care homes must have undertaken the full GSFCH training programme over 9 months, embedded this into their homes for at least 6 months and then undertaken a rigorous accreditation process 'Going for Gold’. Quality Assessment Visit – reviewing the integration of the processes into everyday practice. To achieve accreditation a home must achieve at least 84% of the standards, which includes 4 vital standards. To attain commend status a home must show innovative and established good practice in at least six of the 20 standards. To be recognised as a beacon, a home must show innovative and established good practice across at least 12 of the standards. We are proud of the hard work of all GSF accredited care homes and want to celebrate the sustained excellent practice of care homes which have embedded GSF in their core working practices. In acknowledgment of this, homes that achieve reaccreditation will now be known as GSF Platinum homes. Please use the field below to select your county/region.